A leader in boutique apartment developments throughout Melbourne, Werden Property Group has been carefully crafting contemporary homes for the past 20 years. We asked the group’s Founder and Managing Director, Ray Werden, to share his thoughts on the apartment and boutique property market. What type of residential project are you seeing that’s popular at the moment? Boutique remains king, I think. The downsizer/owner occupier wants well-designed apartments that have large living areas, together with bedrooms that actually work. And they don’t want to live with 100 other people in the block. Share your view on the townhouse market versus apartments. Townhouse and apartment living is really booming in areas surrounded by parkland, shopping, transport and infrastructure such as hospitals and schools. More and more family units are opting to take the low maintenance, affordability and compact living that comes with this type of product as our European and American big city counterparts do, and I think it makes perfect sense. Our apartments generally range in price from $750k to $1.5m so there is something in that range for everyone, from the downsizer wanting to ‘cash in’ to fund their retirement, through to the young couple wanting affordable accommodation in the right postcode, or the single parent families who need to be close to the kids’ private schools. What do you think draws buyers to boutique projects like yours? The WPG group has built up a reputation for delivering well-considered, high-quality boutique developments all over Melbourne. In Stonnington, we’ve sold over 100 apartments in the last few years and we have another 200 either in planning or being marketed as we speak. We care deeply about our reputation and making sure the purchaser has a great outcome from first contact with the agent through to settlement. We also allow as much customisation as possible, which is a major point of difference to our competitors. How are the needs of downsizers shaping the market? With a downsizer I invoke the ‘home replacement protocol’ when working with the agent, design team and builder: Yes, we’re selling an apartment, but more importantly, we’re replacing these people’s homes. So, we have to do what it takes to make this happen for them. Downsizers are typically moving from 20-30 squares to 10-13 squares, and the important factors I’ve found include ensuring there’s plenty of storage for all of their possessions (though they understand there has to be a culling process), a spare or multi-purpose room for friends and grandkids to stay, and ample car parking – you have to allow for a classic car, together with everyday vehicles. In essence, downsizers are leaving behind homes that have been renovated once or twice and so are very comfortable for and have been shaped around their owners. As a result, they are looking to replicate that feeling of charm and comfort from their old homes on a smaller blank canvas. What features are becoming the bare minimum for a contemporary townhouse or apartment? Functional living areas are key. Bedrooms that actually work, especially the master bedroom and ensuite, and in the kitchen there has to be well-considered, functional and durable cabinetry and stone benchtops. Suitable basement parking/garage together with secure storage is also a high priority. And with the area we work in, it’s essential to have meaningful greenery and canopy tree cover so that the development fits in the leafy Stonnington or Boroondara areas. What are 3 keys things buyers should consider when buying off the plan? The developer’s previous projects – it’s vital to know they have the experience to actually deliver a high-quality home. Try to visualise your life within the parameters of the plans and marketing collateral. If it’s not quite right, is there a willingness from the developer or agent to customise to your specifications? The amenity within and close to the apartment/townhouse development. For example how far are things like parks, shops, cafes, public transport, schools, and hospitals. St James 1542-1544 High Street Glen Iris: 22 apartments on 4 levels, sold 5 and reserved 3. Luxurious, boutique development with interiors by Mim Design. Close to Central Park and Hedgeley Dene Gardens as well as public transport, due to commence construction later this year. Little Elm 19-21 High Street Glen Iris: 7 apartments and one shop on 4 levels, expected completion later this year. Close to High Street Ashburton shopping, with Glen Iris train station and fantastic parklands literally across the road. 225 Burke Road Glen Iris: 5 townhouses and 6 apartments on 3 levels, close to the corner of Burke Road. Glen Iris train station is just a short distance away and the High St. tram is right outside your door. Aintree Park corner of Malvern and Aintree Roads Glen Iris: 14 apartments plus commercial on 4 levels, due to start marketing in a few months. Verdant 281 Barkers Road Kew: 10 apartments on 3 levels already 50% sold. Close to MLC, Xavier and Glenferrie Road. Due to commence construction in a few months. 575 North Road Ormond: 16 apartments on 3 levels. Completed, with only a handful of luxurious apartments remaining. 95 Rose Street Essendon: 19 apartments on 5 levels on the corner of Miller Street with tram, train and fantastic shopping right at the doorstep. Completed – only four oversized apartments remain. What are WPG’s property predictions for the next 12 months? I think rates will rise at some point and this will have an effect on the market. The extent of that and whether it extends beyond the middle ring suburbs will be dictated by the quantum of the rate rise(s). Like many market watchers/participants, I feel the market will see a ‘sustained plateauing’ or levelling-off effect. I don’t see prices in the inner and middle suburbs coming off drastically for houses and well-planned boutique apartment/townhouse projects. 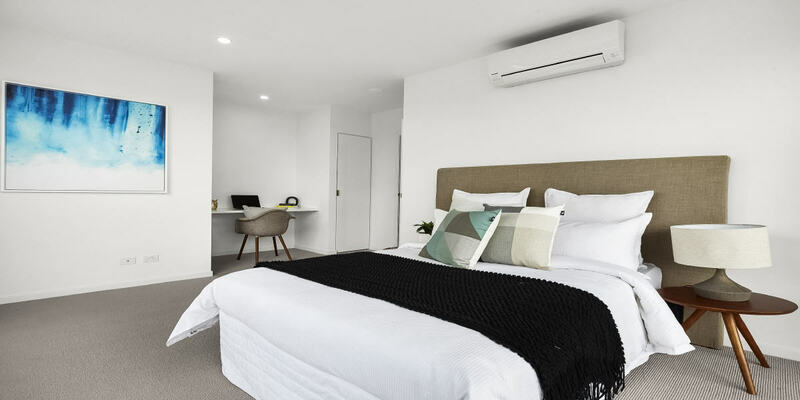 To learn more about Rose, 575 North Road Ormond and St James apartments please enquire on the following pages and an agent will be in contact with you.